Even though you know better, some unseen force draws you up the long path towards the house for a closer look. No good can come of this, you are certain, but the attraction is simply too strong. You must investigate. You are beginning to develop an uneasy sense that all is not right here, but that it is somehow up to you to find out. Church bells in the distance sound out four o’clock in the afternoon. It will be dark soon. 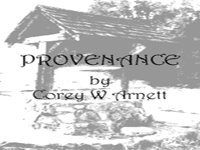 Provenance (Corey W. Arnett; 16-Dec-2005; ADRIFT 4). InsideADRIFT End of Year Comp 2005: joint 11th place. Provenance - at SPAG - by Jim Aikin, October 2006. This page was last modified on 18 May 2018, at 17:47.